Gravitation is a phenomenon through which all objects attract each other. Modern physics describes gravitation using the general theory of relativity, but the much simpler Newton's law of universal gravitation provides an excellent approximation in many cases. Gravitation is the reason for the very existence of the Earth, the Sun, and other celestial bodies; without it, matter would not have coalesced into these bodies and life as we know it would not exist. 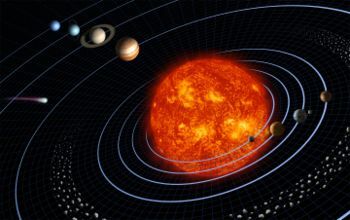 Gravitation is also responsible for keeping the Earth and the other planets in their orbits around the Sun, the Moon in its orbit around the Earth, for the formation of tides, and for various other natural phenomena that we observe. The gravitational force keeps the planets in orbit about the Sun. Since the time of the Greek philosopher Aristotle in the 4th century BC, there have been many attempts to understand and explain gravity. Aristotle believed that there was no effect without a cause, and therefore no motion without a force. He hypothesized that everything tried to move towards their proper place in the crystalline spheres of the heavens, and that physical bodies fell toward the centre of the Earth in proportion to their weight. Another example of an attempted explanation is that of the Indian astronomer Brahmagupta who, in AD 628 , wrote that "bodies fall towards the earth as it is in the nature of the earth to attract bodies, just as it is in the nature of water to flow". Modern work on gravitational theory began with the work of Galileo Galilei in the late 16th century and early 17th century. In his famous experiment dropping balls at the Tower of Pisa and later with careful measurements of balls rolling down inclines, Galileo showed that gravitation accelerates all objects at the same rate. This was a major departure from Aristotle's belief that heavier objects are accelerated faster. (Galileo correctly postulated air resistance as the reason that lighter objects appear to fall more slowly.) Galileo's work set the stage for the formulation of Newton's theory of gravity. In 1687, English mathematician Sir Isaac Newton published the famous Principia, which hypothesizes the inverse-square law of universal gravitation. In his own words, "I deduced that the forces which keep the planets in their orbs must be reciprocally as the squares of their distances from the centers about which they revolve; and thereby compared the force requisite to keep the Moon in her orb with the force of gravity at the surface of the Earth; and found them answer pretty nearly." Ironically, it was another discrepancy in a planet's orbit that helped to doom Newton's theory. By the end of the 19th century, it was known that the orbit of Mercury could not be accounted for entirely under Newton's theory, and all searches for another perturbing body (such as a planet orbiting the Sun even closer than Mercury) have come up empty. This issue was resolved in 1915 by Albert Einstein's new general relativity theory; this theory accounted for the discrepancy in Mercury's orbit. Although Newton's theory has been superseded, most modern non-relativistic gravitational calculations are based on Newton's work due its being a much simpler theory to work with. In this theory Einstein proposed that inertial motion occurs when objects are in free-fall instead of when they are at rest with respect to a massive object such as the Earth (as is the case in classical mechanics). The problem is that in flat spacetimes such as those of classical mechanics and special relativity, there is no way that inertial observers can accelerate with respect to each other, as free-falling bodies can do as they are each accelerated towards the centre of a massive object. The Schwarzschild solution, which describes spacetime surrounding a spherically symmetric non- rotating uncharged massive object. For compact enough objects, this solution generated a black hole with a central singularity. For radial distances from the centre which are much greater then the Schwarzschild radius, the accelerations predicted by the Schwarzschild solution are practically identical to those predicted by Newton's theory of gravity. The Kerr solution solution for rotating massive objects. This solution also produces black holes with multiple event horizons. General relativity accounts for the anomalous precession of the planet Mercury. The prediction that time runs slower at lower potentials has been confirmed by the Pound-Rebka experiment, the Hafele-Keating experiment, and the GPS. The prediction of the deflection of light was first confirmed by Arthur Eddington in 1919, and has more recently been strongly confirmed through the use of a quasar which passes behind the Sun as seen from the Earth. See also gravitational lensing. The time delay of light passing close to a massive object was first identified by Shapiro in 1964 in interplanetary spacecraft signals. The expansion of the universe (predicted by the Robertson-Walker metric) was confirmed by Edwin Hubble in 1929. Every planetary body, including the Earth, is surrounded by its own gravitational field, which exerts an attractive force on any object. This field is proportional to the body's mass and varies inversely with the square of distance from the body. The gravitational field is numerically equal to the acceleration of objects under its influence, and its value at the Earth's surface, denoted g, is approximately 9.80665 m/s² or 32.17405 ft/s². This means that, ignoring air resistance, an object falling freely near the earth's surface increases in speed by 9.80665 m/s (around 22 mph) for each second of its descent. Thus, an object starting from rest will attain a speed of 9.80665 m/s (32.17405 ft/s) after one second, 19.6133 m/s (64.3481 ft/s) after two seconds, and so on. According to Newton's 3rd Law, the Earth itself experiences an equal and opposite force to that acting on the falling object, meaning that the Earth also accelerates towards the object. However, because the mass of the Earth is huge, the measurable acceleration of the Earth by this same force is negligible. Under normal earth-bound conditions, when objects move owing to a constant gravitational force a set of kinematical and dynamical equations describe the resultant trajectories. For example, Newton’s law of gravitation simplifies to F = mg, where m is the mass of the body. This assumption is reasonable for objects falling to earth over the relatively short vertical distances of our everyday experience, but is very much untrue over larger distances, such as spacecraft trajectories, because the acceleration far from the surface of the Earth will not in general be g. A further example is the expression that we use for the calculation of potential energy P.E. of a body at height h ( P.E. = mgh). This expression can be used only over small distances h from the Earth. Similarly the expression for the maximum height reached by a vertically projected body, h = u2 / 2g is useful for small heights and small initial velocities only. In case of large initial velocities we have to use the principle of conservation of energy to find the maximum height reached. The discovery and application of Newton's law of gravity accounts for the detailed information we have about the planets in our solar system, the mass of the Sun, the distance to stars and even the theory of dark matter. Although we have not traveled to all the planets nor to the Sun, we know their mass. The mass is obtained by applying the laws of gravity to the measured characteristics of the orbit. In space an object maintains its orbit because of the force of gravity acting upon it. Planets orbit stars, stars orbit galactic centers, galaxies orbit a centre of mass in clusters, and clusters orbit in superclusters. It is important to note that gravitation is not gravity. Gravitation is the attractive influence that all objects exert on each other, while "gravity" specifically refers to a force which all massive objects are theorized to exert on each other to cause gravitation. Although these terms are used interchangeably in everyday use, it is important to note that in theories other than Newton's, gravitation is caused by factors other than gravity. For example, in general relativity, gravitation is due to spacetime curvatures which causes inertially moving object to tend to accelerate towards each other. Another (but discredited) example is Le Sage's theory of gravitation, in which massive objects are effectively pushed towards each other. A vast number of mechanical contrivances depend in some way on gravity for their operation. 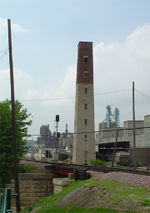 For example, a height difference can provide a useful pressure differential in a liquid, as in the case of an intravenous drip or a water tower. The gravitational potential energy of water can be used to generate hydroelectricity as well as to haul a tramcar up an incline, using a system of water tanks and pulleys; the Lynton and Lynmouth Cliff Railway in Devon, England employs just such a system. Also, a weight hanging from a cable over a pulley provides a constant tension in the cable, including the part on the other side of the pulley to the weight. Examples are numerous: For example molten lead, when poured into the top of a shot tower, will coalesce into a rain of spherical lead shot, first separating into droplets, forming molten spheres, and finally freezing solid, undergoing many of the same effects as meteoritic tektites, which will cool into spherical, or near-spherical shapes in free-fall. Also, a fractionation tower can be used to manufacture some materials by separating out the material components based on their specific gravity. Weight-driven clocks are powered by gravitational potential energy, and pendulum clocks depend on gravity to regulate time. Artificial satellites are an application of gravitation which was mathematically described in Newton's Principia. Gravity is used in geophysical exploration to investigate density contrasts in the subsurface of the Earth. Sensitive gravimeters use a complicated spring and mass system (in most cases) to measure the strength of the "downward" component of the gravitational force at a point. Measuring many stations over an area reveals anomalies measured in mGal or microGal (1 gal is 1 cm/s^2. Average gravitational acceleration is about 981 gal, or 981,000 mGal.). After corrections for the obliqueness of the Earth, elevation, terrain, instrument drift, etc., these anomalies reveal areas of higher or lower density in the crust. This method is used extensively in mineral and petroleum exploration, as well as time-lapse groundwater modeling. The newest instruments are sensitive enough to read the gravitational pull of the operator standing over them. Induced gravity (1967), a proposal by Andrei Sakharov according to which general relativity might arise from quantum field theories of matter. In the modified Newtonian dynamics (MOND) (1981), Mordehai Milgrom proposes a modification of Newton's Second Law of motion for small accelerations. The self-creation cosmology theory of gravity (1982) by G.A. Barber in which the Brans-Dicke theory is modified to allow mass creation.